This is an offering of a two-bedroom apartment, with a shared swimming pool, located at a distance of 900 metres from the famous Chapora Beach and 1.5 kilometres from Vagator Beach. 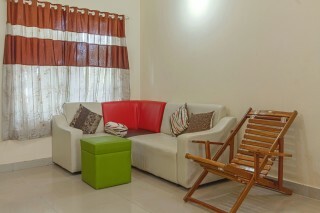 The retreat can accommodate up to six people. Guests are requested to provide valid ID proof at the time of check-in. 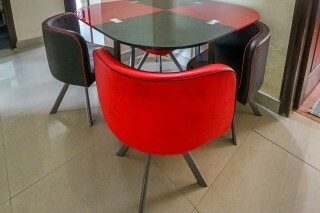 Pick and drop can be arranged on request and on chargeable basis. Services of chef can be provided too on request and on charge of 1000 per day. 1) The guests are requested to provide valid identification at the time of check-in. 2) Pets are not allowed. 3) Please shower before entering the swimming pool. 4) Swimming Costume Mandatory. 5) Pool timings are for 6am-6pm. 6) No food and drinks in the pool area. 7) No glassware or bottles near the pool area. 8) No smoking in the pool or deck area. 9) No diving in the pool. 10) Children under the age of 12 years MUST be accompanied by a person over the age of 18 years. 11) NO LIFE GUARD ON DUTY, SWIM AT YOUR OWN RISK. "Chapora fort & beach in vicinity"
It was a pleasant stay, room was given on time. 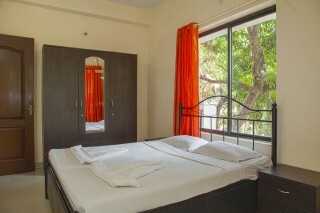 The room is also really close to vagator Beach, they easily added one extra mattress for us on the spot. But otherwise the staff was not that helpful. Important to mention they did not provide wifi. The pool was moderately clean, do not go expecting a five star pool. There are many eateries nearby so getting food is not a problem. There is ample space for parking too. Also there is no AC in the living room. Over all I was happy with the stay, and would choose to stay with this place again. I would say it is value for money, 3 and a half stars from me. Gd place to stay.Had only hot plate in the kitchen, did not have gas.Faced initial problem regarding tv it did not had a balance and had to call up several times.No one was available at the time of checkout had to hand over room keys to the guard.Location wise close to beach,you can walk down in 15 minutes. Daily needs are close by. 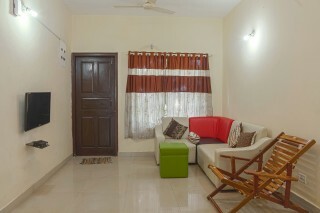 Had a awesome stay at this 2bhk apartment. Very clean and well maintained. It is inside a housing society which has a pool. You can take a dip in the pool too. In short had a awesome stay here. overall it was very good stay. staff was helpful. Nearby to vegator beach. 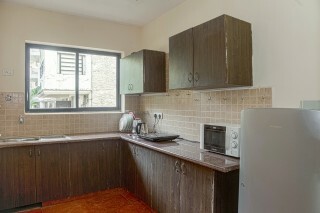 I will again book this property. thanks guesthouser. really very good place to stay. very good location, very good environment. you should visit this place for sure. nice swimming pool out between the apartments. The stay was very nice. 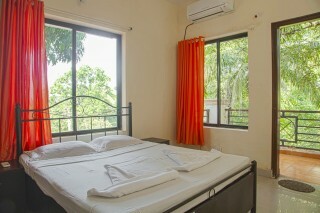 The best part was the location and i will definitely choose the same room again for my next stay in Goa. Adios. very nice and friendly place. nice pool and very close to fort and beach. would love to visit again . clean and comfortable. Madgaon Station- 53 kms approx. Goa International Airport- 42 kms approx.